Deliquesce – definition: 1) to melt away or to disappear as if by melting 2) (chemistry) to dissolve gradually and become liquid by attracting and absorbing moisture from the air, as certain salts, acids, and alkalies. Not sure about chemistry but my fellow Writers Foundation members, Dream Write Publishing staff and I were melting yesterday at the Arts in the Plaza and Strathcona Celebrates. It was a pageantry filled day (my English is showing!) Tanks and military vehicles paraded through the streets and then the horse guards, which were my favorite. Bright red uniforms and gold helmets with tassels flowing. 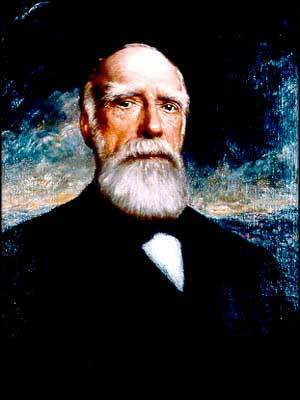 Lord Strathcona – Sir Donald A Smith. 1st Baron of Strathcona, who was born in Scotland. 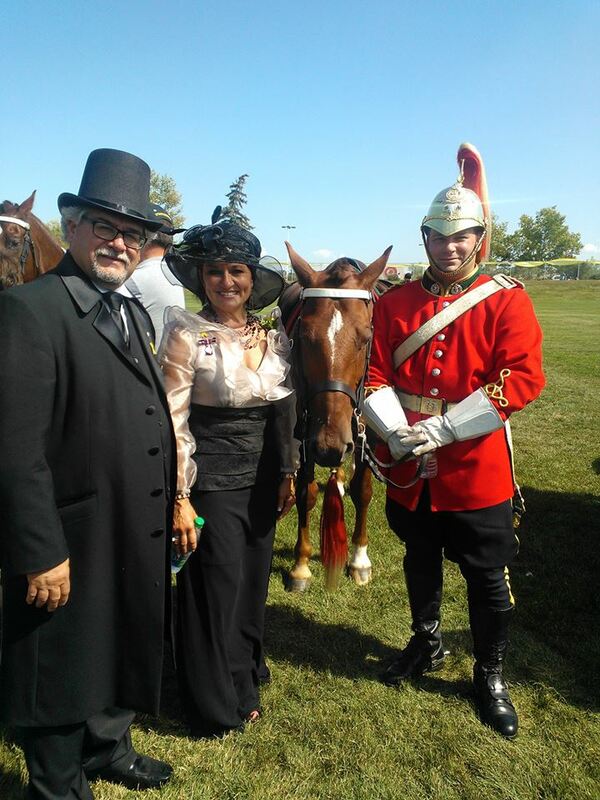 Mayor Linda Osinchuck and horse guard. Luckily we had canopies to shade us and displays of the Writers Foundation history were very popular. I managed to hand out quite a few Rumble coloring competition pages so hopefully there will be lots of entries to judge. I will take no argument – if you can possibly make it to the Arts in the Plaza today, please do. 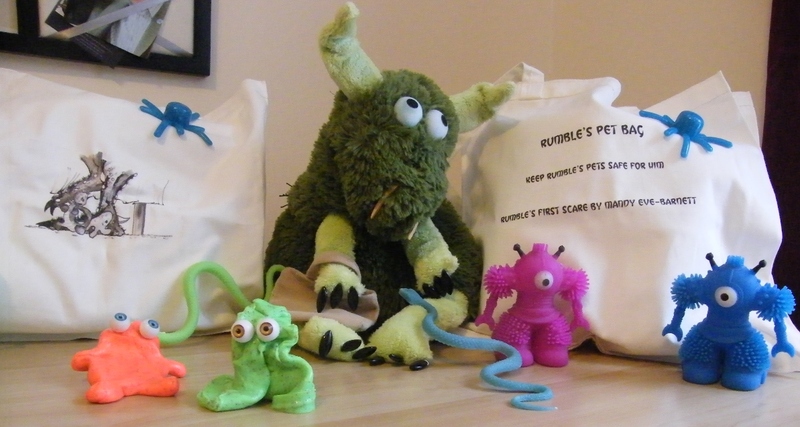 It is a free event and there is original work by authors, artists, potters, weavers – well you get the idea! 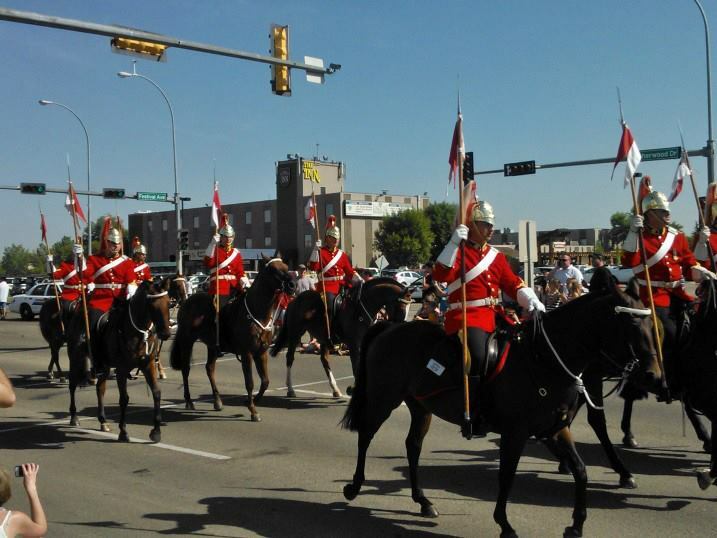 The Mounted Troop is reminiscent of Lord Strathcona’s Horse in the 1920s and 1930s. The 20-horse, 25-member Troop performs the Musical Ride. The ride is drawn from the Regiment’s traditions of the 1920s and 1930s. Please note: zipline and inflatables will close between 1:30 p.m. – 2:30 p.m. for the Military Musical Ride. Official military unveiling ceremony for The Miok-McCormack Memorial located in Broadmoor Lake Park. This memorial is dedicated to the memory of two Sherwood Park soldiers killed in Afghanistan in 2009. This is a community event and everyone is welcome to attend. 6 p.m. – 11 p.m. (Movie starts at 9 p.m.) Former Archbishop Jordan Catholic High School (160 Festival Way). Also includes free family activities from 6 p.m. – 9 p.m. Click here for more details.